Despite our best efforts to avoid it, at some point in a project you’ll likely end up with two drawing files that are supposed to be the same, but aren’t. After running into this issue several times over the years, I learned about the incredible “Compare” feature within the Autodesk Design Review application. Although this has proven to be a great solution over the years, as I mention in my blog post from several years back, using Design Review requires you make DWF’s of your DWG’s. This isn’t exactly a paralyzing step, but I’ve always wished AutoCAD had this feature built-in so I didn’t have to convert from DWG to DWF. AutoCAD Architecture users have enjoyed this functionality for years now, but this feature has been curiously absent from the base (aka vanilla) version of AutoCAD and it’s related verticals such as AutoCAD Civil 3D. 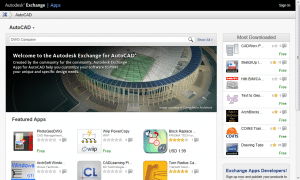 Introduced with AutoCAD 2012, Autodesk launched the App Store they call the Autodesk Exchange. There both Autodesk and third-party developers contribute to an ever-growing library of tools. With many of these tools being free of charge, I’ve come to refer to the Autodesk Exchange as the Express Tools of the 21st century. 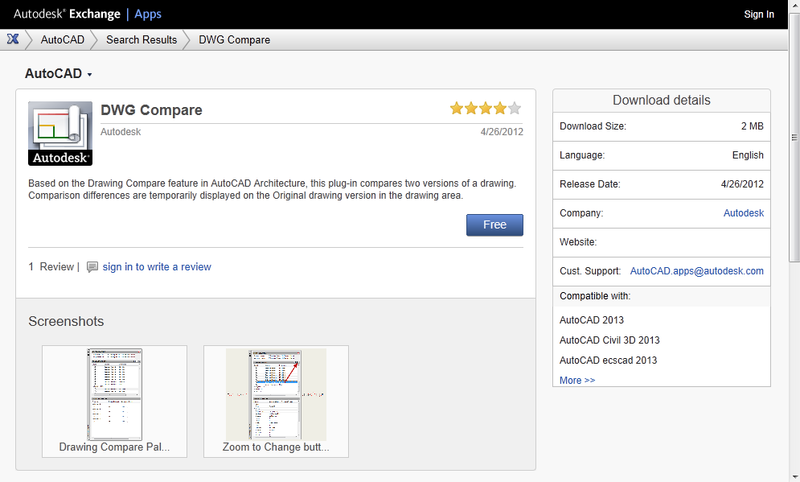 Among the incredible tools on the Autodesk Exchange is a free DWG Compare utility from Autodesk. 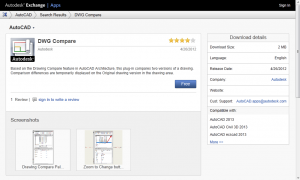 The utility is nearly identical to the DWG compare feature in AutoCAD Architecture, but is now compatible with a range of AutoCAD versions including the base (vanilla) and Civil 3D releases. 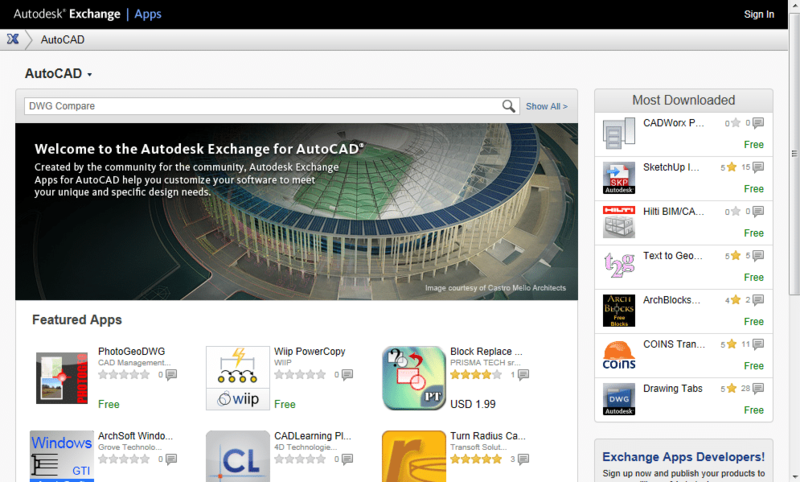 Click the X icon on the InfoCenter toolbar to open the Autodesk Exchange for AutoCAD. You can browse to or search for the app you want. In this case the app we’re looking for is named DWG Compare. Searching for an application from the Autodesk Exchange home page. After you locate the app you’re interested in, click the buy (or Free in this example) button. 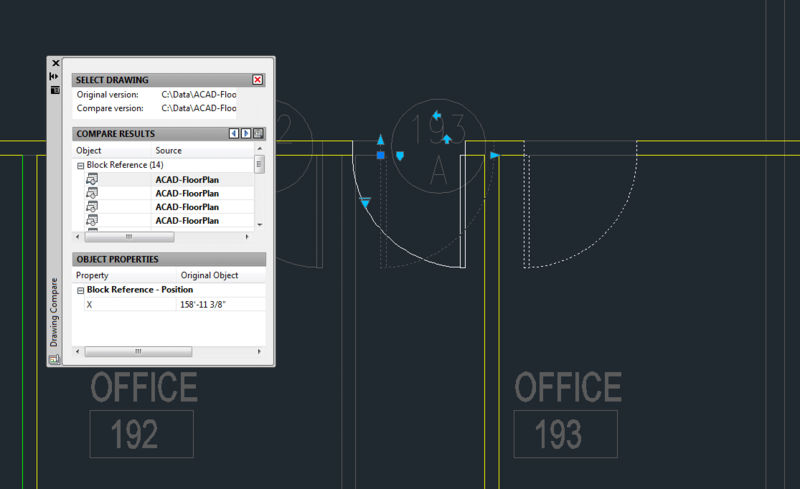 This will guide you through a standardized installation process that will also add the utility to your version of AutoCAD. 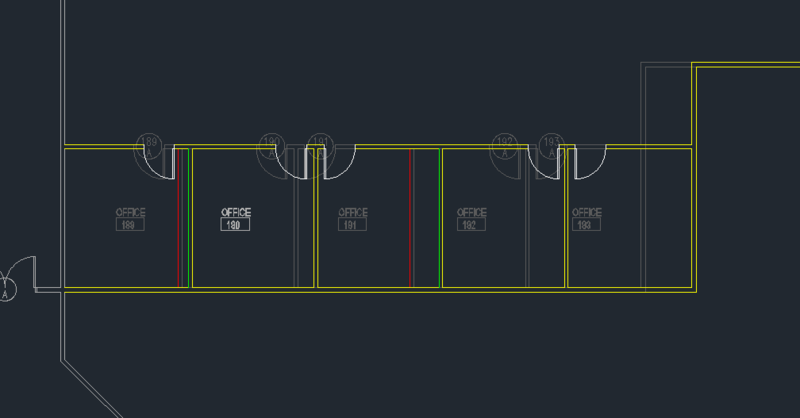 Once installed, you can use the utility by clicking it’s button on the Plug-ins Ribbon tab in AutoCAD. 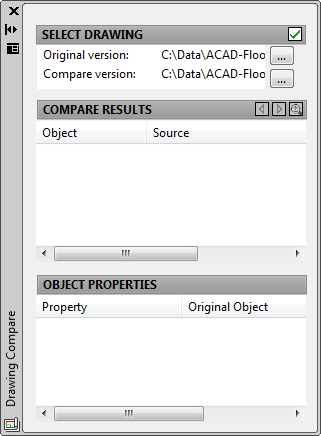 Click the DWG Compare button from the Plug-ins Ribbon tab to open the Drawing Compare palette. Drawing Compare Palette with drawings selected. Select the base or original version of your drawing file. Select the newer version of your drawing file. Click the green checkmark on the right side of the Select Drawing banner on the Drawing Compare palette. From there the DWG Compare utility will take a moment to do its magic. Once complete unchanged drawing elements will change to a light gray color, whereas modified elements will be colored. Here’s a sample of the output you can expect. In this example the offices were stretched out a bit, and the drawing compare feature has highlighted deleted lines in red and added lines in green. In addition to these visual queues, it is also possible to select objects in the Drawing Compare palette and see the original and modified location as shown below. Using the Drawing Compare Palette to analyze block modifications. While certainly one of my favorites, there’s a whole range of applications available to you from the Autodesk Exchange for AutoCAD. If you haven’t checked it out, go have a look, and let me know in the comments what favorite apps you find.